Now automate your manufacturing process by upgrading to CRM. Are you even aware of the possibilities? Manufacturing process may differ and depend largely on nature of business. So CRM software is customized to meet the requirements of your business. So who requires a customised CRM? If your manufacturing process is deals with chemical manufacturing, food cpg manufacturing, Pharma and life sciences manufacturing then you are a process manufacturer who expect simplified sales, service and support processes. CRM software help in coping with changing customer demands, while still adhering to strict industry regulations and fluctuating resource constraints. And if you are into discrete manufacturing like building product manufacturing or Industrial Goods manufacturing then you may need help building products or tackle seasonal demand planning. You may also need to overcome volatile raw material markets, excel at lean manufacturing and meet regulatory requirements. And at the same time improve your sales, service and support efforts . You may also be into Hybrid Manufacturing like a Medical Device Manufacturer. So you require a CRM software that enable manufacturers across sub-industries in better production planning, create end-to end operation enhancements and redefine their sales, service and support processes. CRM software can help create accurate sales predictions. First, it finds the buying patterns of each customer, such as peak times and down times. Then it finds the longer-term trends, such as year-over-year sales increases or decreases. Finally, it takes all of this into account and creates accurate sales predictions that you can use for future planning. Better Planning for the Future . After all, you base what you produce on what you sell. If you don’t know what you think you’ll sell, production planning becomes a string of wild shots in the dark. But by using sales predictions, which include the amounts of each product ordered and when they were ordered, you can create a detailed production plan of how much of each product you should make and when. Those sales predictions have a trickle down effect. They not only enable production planning but in turn help budgeting. When you have a detailed production plan laid out you can have an insight into a budget based on the corresponding production costs. Which means effective planning in terms of future hires, equipment upgrades and more. But as manufacturing process may differ and depend largely on nature of business so CRM software can be customized to meet the requirements of your business. By integrating CRM with your ERP solution your CRM software can have a built-in process manufacturing functionality. This helps to deliver a new focus that accurately assesses likely demands of every customer, during a sales period that is matched to your production output. These kind of CRM software require process training and continued support for CRM solution and outlook and day-to-day issues. 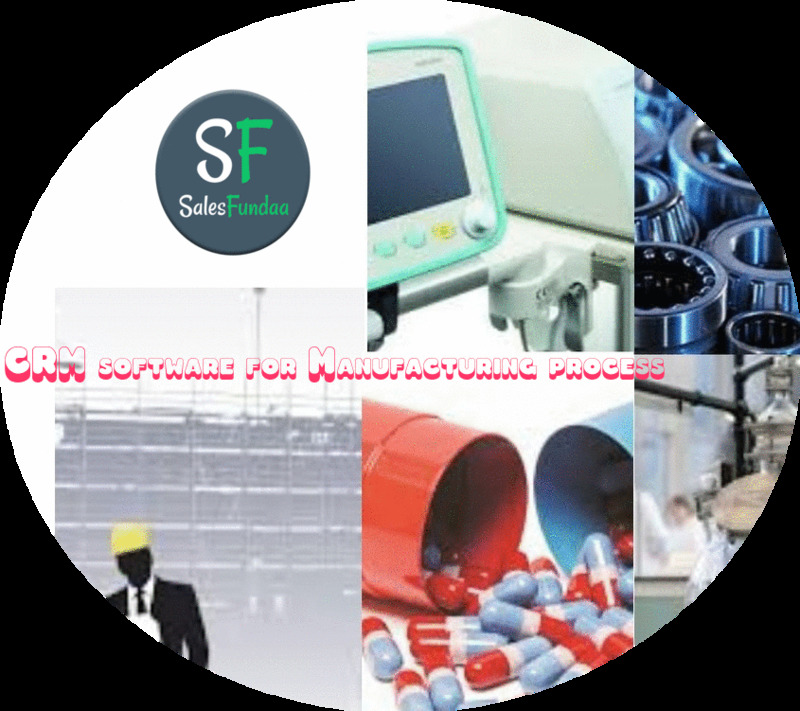 Contact us at SalesFundaa on +91-9235 35 35 35 for more customised manufacturing CRM software or comment on the box below.